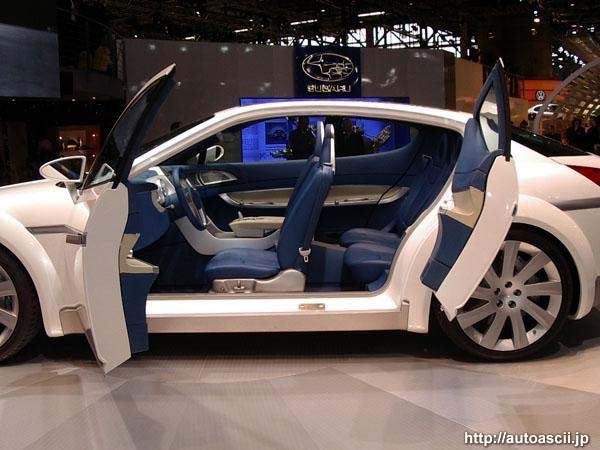 Fuji Heavy Industries Ltd (FHI), a global manufacturer of transportation and aerospace-related products and the maker of Subaru automobiles, today announced the unveiling of a revolutionary concept car, the Subaru B11S, at the 73rd International Geneva Motor Show to be held from 6 to 16 March. Combining sophisticated sporty design with ample interior space, the Subaru B11S represents a new type of four-door Coupe. While it was developed to demonstrate FHI's future design direction and its strengthened design capabilities, the Subaru B11S also features superb driving performance, which is ensured by a symmetrical AWD (all-wheel drive) system in combination with a horizontally-opposed engine. Since Kyoji Takenaka assumed the title of President and Chief Operating Officer in June 2001, FHI has been enhancing its design capabilities as part of company-wide reforms aimed at improving the Subaru brand. One year later, as FHI began placing greater emphasis on the importance of design development, the long experienced Subaru car designer, Kiyoshi Sugimoto, was promoted to the position of Vice President and General Manager of Subaru Design Department, which marked the first time that a car designer was appointed as an executive officer. 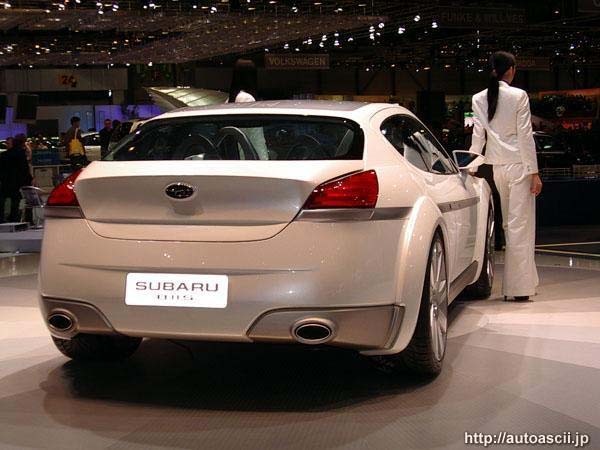 The Subaru B11S is the first concept car designed under the leadership of Mr. Sugimoto with guidance from Mr. Takenaka in initial concept development. The Barcelona-based independent design studio, Fuore Design International, under the leadership of Erwin Himmel, which has been retained by FHI as a consultancy, contributed to the creation of the B11S. The B11S has been developed to pursue the concept of Gran Utility Turismo, which symbolises the embodiment of the perfect blend of sporty driving, comfort, functionality and elegance. 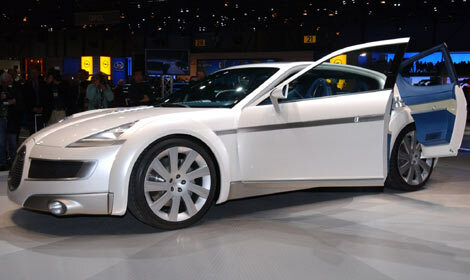 The car incorporates all the crucial ingredients of this concept. It features attractive styling and packaging, which further reflect FHI's corporate philosophy, Innovative, Individual and Courageous; Subaru's technological strengths, such as the horizontally-opposed engine and a symmetrical AWD system; and driving performance equivalent to a high-performance sports car for the enthusiast. The exterior design, composed of sophisticated flowing curves, expresses an elegant, sleek Coupe, in spite of the fact that the car comfortably accommodates four adults. The front fascia, which fortifies its sporty look, conjures up the turbine of a small jet plane and the freedom of flying wings - an association with FHI's corporate roots as an aircraft company, as well as a reminder of outstanding aerodynamic technology and performance. The two pairs of side doors open like gates and latch in the middle without a conventional B-pillar, an arrangement that facilitates access to the back seats and makes interior room seem even more spacious. Developed specifically for the B11S, the frosted glass roof provides an open-air feeling, as in a convertible, and it creates a pleasant soft light inside the vehicle that enhances the quality look of its interior. The unique glass roof design was inspired by the design and construction of traditional Japanese umbrellas. In sharp contrast to the white pearl body colour, for the interior of the B11S the colour blue has been selected, influenced by Subaru's characteristic colour. Strong emphasis was placed on crafting an understated yet high-quality ambience in the cabin's design, which is reminiscent of Japanese interior decoration and its attention-to-detail approach. In addition, the folding rear seats allow easy access to and from the trunk for luggage or sports equipment. The interior provides a comfortable space for passengers and offers practical solutions at the same time. The B11S has been equipped with a new horizontally-opposed, 6-cylinder engine. This engine, which will meet both the needs of driving pleasure and the demands of environmental considerations, is currently under development. A twin turbocharged engine is being developed that will ensure a smooth ride in low- and middle-speed ranges while it achieves a maximum output of 294 kW (400 PS) and a maximum torque of 550 Nm (56.1 kgfm). The symmetrical AWD system integrated with a 5-speed automatic transmission comes with VTD (variable torque distribution), Subaru's unique, electronically controlled torque distribution system. While the basic torque distribution ratio of front to rear wheels is set at 35% and 65% respectively, the VTD optimally controls the torque distribution between front and rear wheels according to driving conditions and realises a high level of balance between the yawing tendency of a vehicle and high-speed stability. Some pictures from the Japanese language Auto ASCII site. There are further pictures on their site. From the Geneva Motorshow website itself, this picture shows how pointed the front of the car really is and how far the headlights are back from the nose. 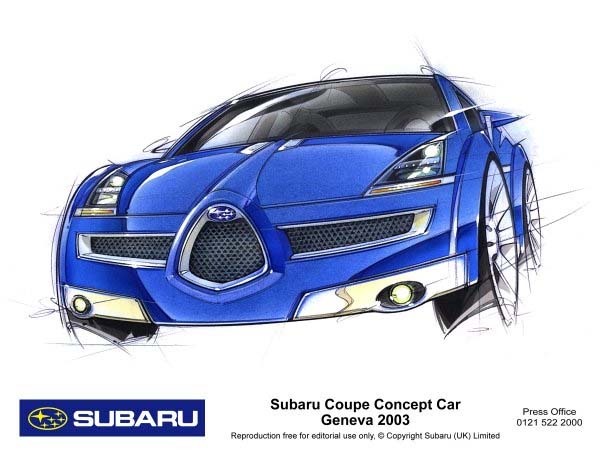 To be unveiled on the 4th of March at the Geneva Motorshow by FHI President Mr Kyoji Takenaka, the 4 seater coupe which is codenamed the Subaru B11S shows a distinct Alfa feel about the front end. 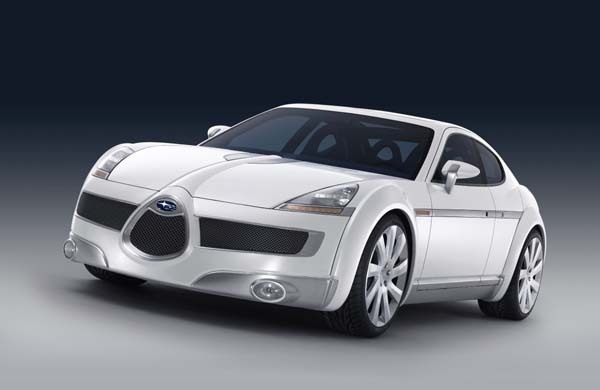 This is not surprising, but is a little disapointing, as the Subaru design studio is now headed by ex Alfa designer Andreas Zapatinas. Question is....where will the number plate go? Also is it turbo charged because there is no scoop on the bonnet, so does this mean it has a front mounted intercooler?